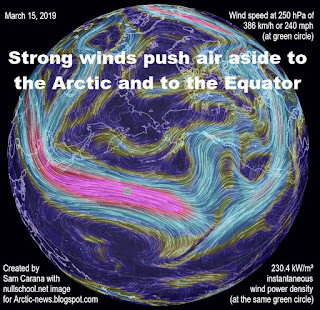 Wind patterns on March 30, 2019, resembled what Edvard Munch wrote in his diary in 1892, i.e. "I sensed an infinite scream passing through nature", a feeling Munch expressed in his iconic artwork The Scream, part of which is added on the right in above image. Indeed, at the end of March 2019, it felt like an infinite scream passing through nature! 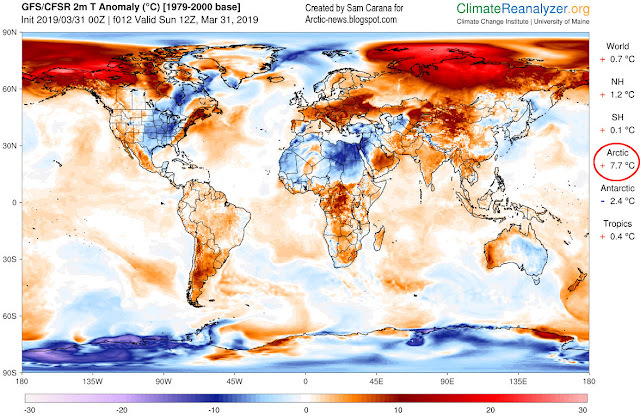 On March 31, 2019, 12:00 UTC, the Arctic was 7.7°C or 13.86°F warmer than 1979-2000, as above image shows, while in parts of Alaska the anomaly was at the top end of the scale, i.e. 30°C or 54°F above 1979-2000, as discussed in an earlier post. What caused this to eventuate? Firstly, as the Arctic is warming faster than the rest of the world, the temperature difference between the North Pole and the Equator is narrowing, which is slowing down the overall speed at which the jet stream is circumnavigating Earth, while it also is making the jet stream wavier, enabling warm air from the Atlantic Ocean and Pacific Ocean to more easily enter the Arctic, while also enabling cold air from the Arctic to more easily descend over Asia and North America. At the same time, global warming is making oceans warmer. Sea surface temperatures were high in the path of the jet stream on March 15, 2019, as above image shows. The sea surface was 10.8°C or 19.4°F warmer than 1981-2011 at the green circle in the left panel of above image. On that day, surface air temperature there was as high as 7.9°C or 46.2°F, and there were cyclonic wind patterns, as the right panel of above image shows. High sea surface temperatures are causing winds over oceans to get much stronger than they used to be at this time of year. 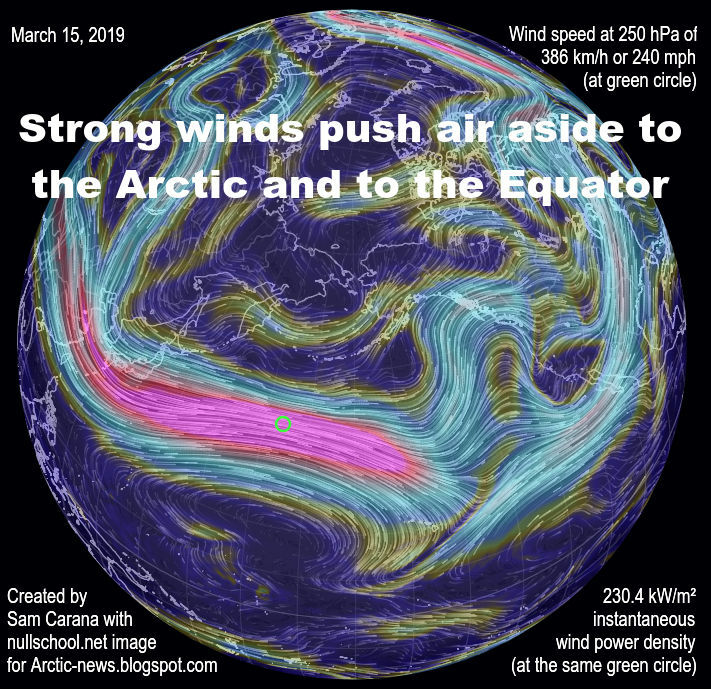 The image on the right shows that, on March 15, 2019, the jet stream reached speeds as high as 386 km/h or 240 mph at the green circle. These stronger winds then collide at high speed with the air in front of them. This collision occurs with an even greater force, due to low temperatures over North America and due to the lower overall speed at which the jet stream circumnavigates Earth. All this makes that air gets strongly pushed aside toward the Arctic and the Equator. On March 30, 2019, strong winds pushed warm air into Bering Strait, resulting in temperatures as high as 2.5°C or 36.4°F, as the image below illustrates. On March 30, 2019, Arctic sea ice extent fell to a record low for the time of year, as discussed in an earlier post. 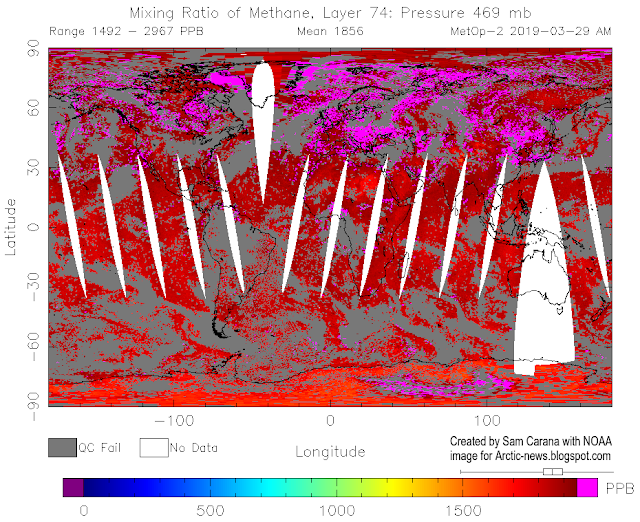 Ominously, methane reached peak levels as high as 2,967 ppb on March 29, 2019, as the image below shows. With Arctic sea ice extent this low and with temperatures rising relentlessly, fears are that the sea ice won't be able to act as a buffer to absorb heat for long, and that a strong influx of warm, salty water will reach the seafloor of the Arctic Ocean and trigger methane eruptions from destabilizing hydrates.